Social Media, from The Self-Published Writer workshop held on Saturday, Jan. 27, 2018. Selling Your Books, from The Self-Published Writer workshop held on Saturday, Jan. 27, 2018. The Editorial Tangle, from The Self-Published Writer workshop held on Saturday, Jan. 27, 2018. Cover Art, from The Self-Published Writer workshop held on Saturday, Jan. 27, 2018. Self Publishing Options, from The Self-Published Writer workshop held on Saturday, Jan. 27, 2018. Featuring Claire Johnson (moderator) with Thomas Burchfield, Sabrina Flynn, Bette Golden Lamb, J.J. Lamb & Gigi Pandian. 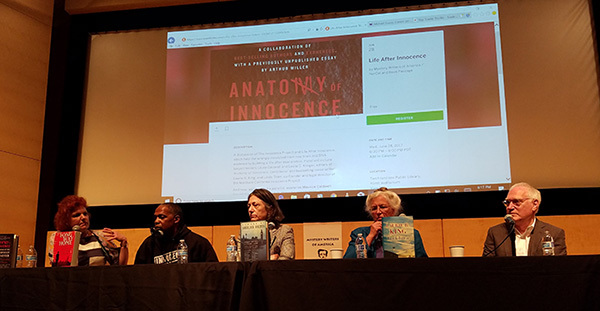 Laurie R. King and Leslie S. Klinger speak with Rick Kleffel about Anatomy of Innocence at the San Francisco Public Library MWA NorCal-sponsored Anatomy of Innocence event, June 28, 2017.